Selected Villas for rent near Beyond The Sea (Koh Samui) - Contact us now! Love is in the air at Beyond The Sea! Guests here will enjoy a fine dining experience in a classy and cosy setting. 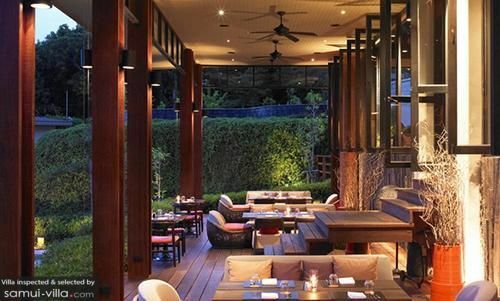 Whether you dine indoors or outdoors along the deck, you will be rewarded with unobstructed panoramas of the coast, for the restaurant is bedecked with expansive floor-to-ceiling windows. Start the evening with a selection of well-made concoctions from the sleek bar, and pair them up with unique Thai-style tapas such as crispy spiced calamari or a creamy risotto. A selection of irresistible mains, such as lobster with basil or green curry king prawns and scallops will round off your meal on a perfect note.